[213 Pages Report] The market for the global dry construction industry has seen an extensive upward surge since 2009. The global dry construction market is projected to reach USD 79.08 Billion by 2020, with a CAGR of 5.3% during the forecast period, (2015 to 2020). After the economic slowdown, new constructions have come up in large numbers, the high requirements for fast implementation of construction site, and the inexpensive nature. The Asia-Pacific region accounted for around 33% of the total market share in terms of value, followed by the North American and European regions. However, as the dry construction market in developed countries is getting matured, the markets in developing countries such as China, Indonesia, and India are estimated to grow at a higher rate from 2015 to 2020. China is estimated to grow faster than any other country because of its high population along with new constructions coming up in the next five years. The dry construction market has been growing in accordance with the construction industry. With growing awareness about global warming and concerns about the environment, people are opting for eco-friendly techniques of constructions, which have had an impact on the market for dry construction products. This report estimates the market size of the global dry construction market in terms of value (USD billion). In this report, the market is broadly segmented based on type, material, system, application, and region. Market drivers, restraints, challenges, raw material, and product price trends are discussed in detail. Market share, by participant, for the overall market is discussed in detail. The global dry construction market has grown exponentially in the last few years and this trend is expected to continue. Increasing disposable incomes of people in developing countries, regulations to incorporate dry construction, and changing preferences of people towards sustainable building techniques drive the growth of the dry construction market. 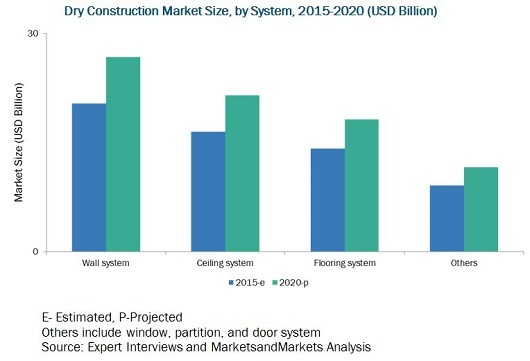 The global dry construction market is estimated to reach USD 78.09 Billion by 2020, with a projected CAGR of 5.3%, signifying a steady increase in the demand for construction industry. Increase in the usage of recycled material in the manufacturing process, and significant increase in urbanization are the other factors which are driving the dry construction market. The wall system segment is projected to grow at the highest CAGR of 5.7% from 2015 to 2020. The global dry construction market is marked with intense competition due to the presence of a large number of both big and small firms. New product launches, mergers & acquisitions, and partnerships and expansions are the key strategies adopted by market players to ensure their growth in the market. 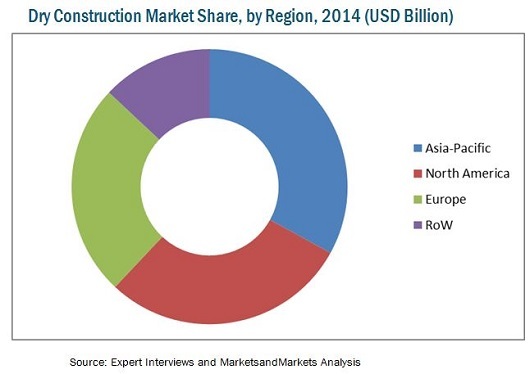 The key players in the market are the key players in the dry construction market are Saint Gobain (France), Xella Group (Germany), Armstrong World Industries (U.S.), Etex Group (Belgium), Fletcher Building (New Zealand), USG Boral (Malaysia), CSR (Australia), Knauf (Germany), Panel Rey (Mexico), and Pabco Gypsum (U.S).